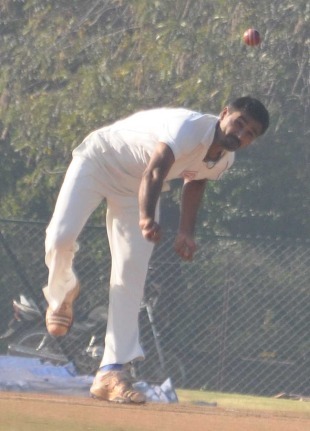 Baroda captain Pinal Shah has defended his decision to bowl on a dry, grassless Moti Bagh wicket that played low and slow on the first day of the Ranji Trophy final, saying he expected some moisture to help the seamers. Rajasthan adopted an extremely cautious approach, but were strongly placed at 198 for 3, and would have been in an even better position were it not for captain Hrishikesh Kanitkar's late dismissal. "It looked to be a batting wicket. Earlier we were going to play only two seamers. But in the morning, we felt there was some moisture around despite the grass having been removed," Pinal said. "That's why we played an extra allrounder in Abhijit Karambelkar. They have some batsmen who score big, like Aakash Chopra, Hrishikesh Kanitkar and Ashok Menaria, and we thought if we could get them in the morning, it would be great for us." Mukesh Narula, the Baroda coach, told ESPNcricinfo that it was a last minute decision to bowl and explained it was a combination of the conditions and a wariness of Rajasthan's batting that dictated the choice. "The first thing I noticed this [Tuesday] morning was that there was dew around, and we felt that we could utilise it," he said. "Also, Rajasthan's batting has been in good form, and we thought there was a chance they could chase down whatever we would manage to put up." Having played three seamers, Baroda would have certainly wanted a better return from them than the 46 wicketless overs they bowled. "I think our fast bowlers could have done a much better job today," Narula said. Rajasthan were pleasantly surprised by Baroda's decision, as they themselves would have batted first. "I guess the only reason they didn't bat was because they might have been wary of our seam attack of Pankaj Singh and Deepak Chahar," Aakash Chopra, the Rajasthan opener, said. "I can't think of any other reason, as they had removed all the grass from the wicket, which was very dry." Kanitkar's wicket towards the end evened things out slightly on a dreary first day, but the Rajasthan captain was satisfied with his side's approach. "I should not have got out. But I am happy with the way we played," he said. "It was not an easy wicket to bat on as the ball was keeping low and not coming on. And once they knew we were well set, they stopped attacking, and started bowling to defensive fields." Rajasthan are eyeing a score of at least 400 now, after the steady start, and Kanitkar felt that despite losing himself and Chopra, they had the batting line-up to pile on the runs. "Ideally, I would be really happy with 550, but a minimum of 400 is needed," Kanitkar said. "Most of our batsmen have been among the runs. And we are playing the finals, so everyone should be ready to do the job." Contrary to Baroda's choice to play an extra seamer, the dry nature of the surface prompted Rajasthan to leave out steady third seamer Sumit Mathur in favour of offspinner Madhur Khatri. "Sumit has bowled his heart out throughout the season. I feel very bad that he could not play this game. But that is what the wicket was demanding," Kanitkar said. While both sides have gone in with two specialist spinners, Chopra felt the Rajasthan new-ball duo of Pankaj and Chahar could still be dangerous on this track. "Pankaj is six-foot plus, and from that height, on a wicket that is keeping low at times, it [the bounce] can become very uncertain for a batsman," he said. "And Chahar does not depend on the wicket; he generates a lot of swing in the air." Baroda are hoping they can get something out of the wicket tomorrow morning. "The first session is important," Narula said. "If we can get a few wickets, we are right back in the game as they have gone very slowly till now."